does it! On time and on budget!!!" Much of today's TV programming is best viewed on a wide screen display. Current TV shows are broadcast in wide screen HD format. With your traditional TV set, you are only seeing part of the picture. HD broadcasts and DVD movies also incorporate surround sound audio. 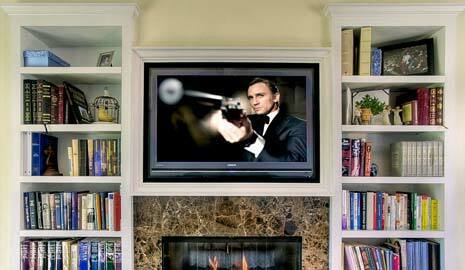 Updating with surround sound speakers and audio gear can dramatically enhance your viewing experience. Options are now available to conceal your flat screen TV behind movable artwork or mirrors. Home theaters are great for relaxing, entertaining, and bringing the whole family together. 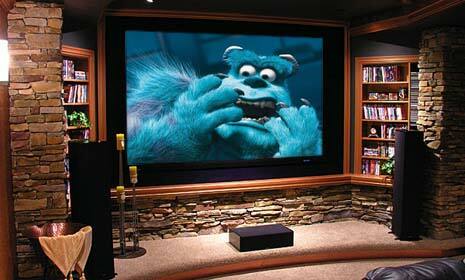 With the right planning, investing in a home theater can be one of the best enhancements to your lifestyle. Santa Barbara Smarthomes can design and install surround sound or media entertainment systems in your family room, game room, master bedroom, or we can create a dedicated home theater room customized to your specifications. We carry a wide range of flat panel TVs and supporting audio/video equipment to ensure a great looking and sounding system that can be tailored to meet any requirement and most any budget. With the recent advances in high definition plasma and LCD televisions, there's never been a better time to install a home theater system or upgrade your older TV. A new high definition TV paired with a Blu-ray player or with HD service from your cable or satellite provider will provide a picture with breathtaking detail and clarity. Many of our custom home theater and media room installations include easy to use one touch remote controls, lighting control and motorized window treatments. 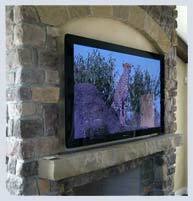 We provide professional flat screen TV installation and handle everything from simple on the wall or over the fireplace installs to elaborate custom installations. Santa Barbara Smarthomes specializes in concealing Plasma and LCD TVs behind mirrors, moving artwork or within cabinetry. The video below shows one of our installations where a single button press on the remote automatically raises artwork, dims the lights and turns on the TV. Contact us today to schedule a free in home consultation to discuss your Home Theater, Media Room or Flat Screen TV installation.